As the World Record Holder for sounding like forty hammered dulcimers at once, clocking in at an average speed of 339.5 notes per minute, Lucille Reilly, “double-threat virtuoso of hammered dulcimer and autoharp” (as per the John C. Campbell Folk School), is hailed as both the Vanna White of the hammered dulcimer and as Folk Music’s Best Kept Secret. Since her New York City début at the Port Authority Bus Terminal in 1982, she has thrilled the masses at Keystone Racetrack, Philadelphia, PA; the Harvard Square “T” station, Cambridge, MA; Chemical Bank, New York City; Hahn’s Homemade Bagels, Hanover, PA; Phil’s Citgo Station, Ringoes, NJ; Clay’s Possum Pit, Brasstown, NC; as official dulcimatrix for Strawbridge & Clothier, Philadelphia (Liz Claiborne department, all stores); and as being the fifty-first and sixty-second performer of the Arizona Folklore Preserve (thus establishing herself as not quite playing with a full deck but doing so at lightning speed). And she’s brought the autoharp to new heights: Now that she’s played for the retiring of the colors on the widow’s walk of the Old Faithful Inn, Yellowstone National Park (elevation 8,250 feet), her next highest desire is to perform autoharp in the bell tower at St. John’s Cathedral, Denver, CO (elevation 5,340 ft., although she’ll probably have to settle for the carillon tower at Christ Church Cranbrook, Bloomfield Hills, Michigan in July 2004, elevation 644.75 ft.). She also performed the First Annual Going Out of Business Concert for Caffe Gelatto, Wichita, Kansas. Prior to winning the National Hammered Dulcimer Championship in 1997, she was so well known as Everybody’s Favorite Second-Place Hammered Dulcimer Champion (a title she enjoyed for 16 years) that she even clinched the red ribbon at one contest without showing up to compete. 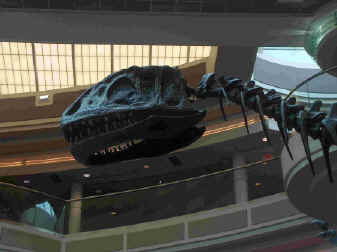 In her spare time, Lucille can be found waiting for music friends under the head of T. Rex at Hartsfield International Airport, Atlanta GA (at right). And if she can ever find Father Guido Sarducci, Lucille plans to pursue a master’s degree from his Five Minute University for mastering the art of “pumping felt” on diatonic autoharp in 30 seconds or less. Except for the last statement, all of the above is, alas, true.